"He is shouting like mad, only hark2! "He was always a desperate wag4!" On the top of a neighbouring crag5. While they waited and listened in awe6. Here is the earliest occurrence of "bounding on tail tip" I have encountered, the next one I know of being the version of Tigger created by Disney. It's an interesting idea, actually, though probably not something that could ever be physically possible given the way tails are actually structured. In the pre-hominid period of our existence, humans had tails as well, today reduced to several fused vertebrae at the end of our spines that serve as anchor points for some of the muscles important for walking upright. "Hark" primarily means listen, and is yet another of the archaic words rarely heard outside of formulaic phrases such as in the song "hark, the herald angels sing" (as a child this phrase confused me since I didn't recognize the verb, and who was Harold anyway?). Another use that remains somewhat common is the phrase "hark back" usually defined as to think back on something, especially to remember something past. It seems an odd extension, perhaps from the idea of shouting "hark, don't forget the milk!" "To wag" meaning to wave from side to side, referring only to animals in the english dialect I speak. A person who moves their head to mean "no" shakes their head from side to side, while they nod, move their heads up and down to say "yes." I did not realize these were dialect-specific uses until faced with explaining how a person answered a yes or no question to an american who came originally from arkansas. She became more and more confused with the explanation until finally she interrupted, wanting to know why anyone would nod when they meant yes, by which she meant shake their head. According to my electronic OED, a wag is "a person who makes facetious jokes." That is, someone who treats serious matters as funny. The Baker has never engaged in such behaviour, in fact if anything he has behaved in exactly the opposite manner. Overall the Bellman and his crew are quite a humourless lot. Crag is a surprisingly interesting word, having entered english quite recently, the eighteenth century from a celtic language. I suspect, though cannot yet confirm, that it is one of many words referring to rock or stone lacking any accepted indo-european etymology. Why rock or stone in particular should be specially marked out this way is a puzzling coincidence. Rock is also ultimately of unknown origin, though stone "stone" itself is likely from the same indo-european root as the common words stand and set. They are reverentially surprised and a little scared according to my dictionary; the reverential bit is an odd response to a monster. Perhaps this odd detail inspired arguments for the snark representing complete truth or something similar (there is considerably more in Carroll's background and the poem itself to support such arguments). So here we are at the Baker's disappearance, barring a faint trace of him in the accompanying illustration, caught in mid-scream. 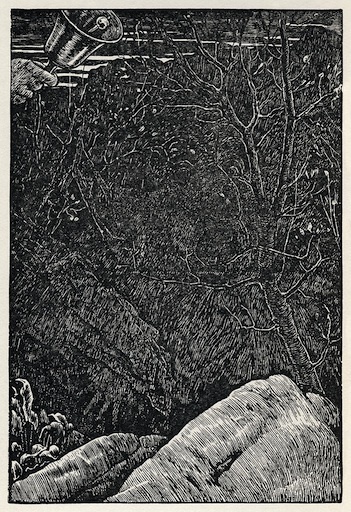 To add to the oddity of things, just above we read that he leapt from a cliff, presumably the one the illustration shows to us, so it's no surprise he has vanished. This is the general result of leaping off a high cliff as the light fails; the great puzzle is why he jumped. Ignoring the cliff-jumping, the idea of an erasure of all physical trace of the Baker is an interesting one: he is genuinely removed from physical existence, persisting only in the memories of the rest of the crew, the poem, and of course the reader. Lewis Carroll has made sure of this, because the Baker forgot all his luggage on the beach. In the end, it seems that Lewis Carroll's best poetry was written in his younger years. He did produce one more poem of interest from the nonsense perspective, the mad Gardener's song from the appalling Sylvie and Bruno books. It appears in dissected form stretched across the two volumes, in itself a rather disturbing presentation on many levels. He looked again, and found it was A Vegetable-Pill.